Transform family night into a creative, fun, book-centered kindness practice! The book for May 2013 is Rabbit & Squirrel: A Tale of War and Peas by Libba Moore Gray. Peace is a state of mind as well as a state of the world. This entertaining book demonstrates how jumping to conclusions, misunderstandings and revenge can lead to can lead to all out war. This book is a great springboard for conversations about how we can each create peace in our own lives. You'll even create a family work of art to remind yourselves of your commitment to peace. Plus, enjoy your veggies - the one good example Rabbit & Squirrel offer - with a great recipe from The Kids Cook Monday. If you are a subscriber, you have already received your beautiful book, the following materials, plus a shopping list, book suggestions for older readers, and a fun BHF book mark right in the mail. Thank you for supporting our nonprofit work! If you would like to subscribe, head on over to our SHOP to get started. If you already own the book or would rather use your library, we invite you to download these materials for your own big-hearted family night! When you’re done, join us back here and share your stories. Or join the discussion on our Facebook page! The Book Discussion: Conversation Starters for Rabbit & Squirrel. The Recipe: Veggie-full Croissants provided by our friends at The Kids Cook Monday and created by Michelle of The Kids Cook Monday. Visit The Kids Cook Monday for more great recipes for your young chefs. The Kindness Activity: Family Peace Quilt. Spend time with your family creating a visual pledge to build peas - er - peace. This tender subject is too often avoided in my house. Or maybe it comes up too often. As with everything else, there are times when we focus and talk about this a lot, and times when it nearly disappears from our thoughts. Obviously, death is a natural part of life. It is a painful part of life, and love, and empathy. When the children have questions about this heavy subject, I do my very best to answer them earnestly, honestly, and bravely. Our calico kitty suddenly passed away last week, only a year after we adopted her, bringing the topic of death and dying back to the forefront of our minds. Here are a few beautiful books to help your family begin a conversation about death, and life too. This simple non-denominational poem beautiful expresses the release, relief, and freedom death might bring. My children have returned to this book many times over the years. It certainly is more abstract and artful than instructional, but it has brought us peace many times. Water Bugs and Dragonflies: Explaining Death to Young Children by Doris Stickney (Pilgrim Press, 2012). Stickney adapted a graceful fable about a water bug that changed into a dragonfly in order to explain death to a five-year-old. This book is more traditionally religious than The Next Place.My family was most interested in the metaphor of the dragonfly larva, who live below the surface of the water, and the adult dragonflies, to illustrate the notion of someone going beyond our sight, to a marvelous place. The Fall of Freddie the Leaf: a story of Life for all Ages by Leo Buscaglia (Slack Incorporated, 1982). This classic story is perfect, both simple and comforting. A little leaf named Freddie and his companion leaves change with the passing seasons, finally falling to the ground with winter's snow. As an avid gardener, I use nature often to teach kids about the circle of life and death. This book makes that analogy come alive. Lifetimes: The Beautiful Way to Explain Death to Childrenby Bryon Mellonie (Bantam, 1983). "All around us, everywhere, beginnings and endings are going on all the time. With living in between." This is a book to fall in love with, a book to read even when death is not a major topic around the house. The Tenth Good Thing About Barney by Judith Viorst (Atheneum Books for Young Readers, 1987). This book is on the secular end of the spectrum. The writing is beautiful, the story is simple, and my children found it extremely comforting. They've been preparing their lists of good things about their own cat for our own kitty memorial service. Please share your recommendations. I realize the topic of death is deeply entwined with personal spiritual beliefs, so feel free to share whatever speaks to you and your family. There are likely many others just like you who will be grateful for an additional resource. As America faces record poverty rates and increasing income disparities, it becomes more and more important that we take action in whatever ways we can. Big-Hearted Families has an impressive and diverse list of project ideas to Fight Poverty with your family. Nothing inspires action quite as much as a good story, which is why we've assembled this short list of our favorite books on the subect. These 5 picture books about hunger and poverty will help you bring up this difficult subject in a thoughtful way. Plus, they are each excellent stories. How does it feel when you are hungry and you have to wait to eat? What are ways we could help those who are hungry? Older readers (8 to 12) may enjoy Along Came a Dog by Meindert DeJong, illustrated by Maurice Sendak, about the unlikely friendship between a little red hen and a homeless dog. Uncle Willie and the Soup Kitchen by DyAnn DiSalvo-Ryan (Morrow. A young boy who is afraid of homeless people gains a new perspective when he helps his uncle work at the soup kitchen. Dear Mr. Rosenwald, by Carole Boston Weatherford (Scholastic). This book is based on actual events in the 1920s, when a philanthropist - the founder of Sears - offered money to African American communities to build schools—but only after they raised money themselves. For an impoverished community, this was a difficult task. This story of how they achieved it is very inspiring. The Lady in the Boxby Ann McGovern (Turtle Books). It is wintertime in the city and freezing cold, but not everyone is inside and warm. Ben and his sister Lizzie know that there is a lady who lives outside in a box over a warm air vent. The children worry about the kind-looking lady, and begin sneaking food and clothes out of their apartment for her. Gently told and powerfully illustrated in rich hues, The Lady in the Box deals candidly with the issue of homelessness. Fly Away Home by Eve Bunting (Clarion Books). This heart-wrenching yet hopeful book follows a boy and his father through their daily routines as they shelter in an airport, obviously before airline security become so strict. This is book especially fostered a lot of conversation in my house. It perfectly presents the heartbreak of being a homeless child in a non-threatening, non-frightening way. One Potato, Two Potato by Cynthia DeFelice (Farrar). For a more whimsical approach to the issues of hunger and sharing, this folktale while entertain and edify any audience. It's a variation on the theme of a magic pot, featuring a community pulling together. It's a new favorite. Gratitude... 'tis the season, right? I do think it's helpful to have a holiday devoted to giving thanks, even though I aspire to a year-round practice of gratitude.Expressing gratitude, even out of obligation, helps me clearly see the abundance of love, of comforts, and of freedoms that surround me. Research shows that people who regularly express gratitude are happier and healthier than their counterparts, regardless of measurable wealth. To that end, here are a few books to inspire a gratitude conversation with our children. They also happen to be wonderful stories. Don't forget to scroll down for a few additional recommendations for older readers, plus discussion questions to get you started. Please share your recommendations in the comments! 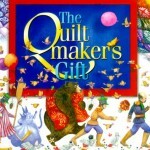 The Quiltmaker's Gift by Jeff Brumbeau (Pfeifer-Hamilton). A very talented seamstress makes beautiful quilts for the poor and the homeless When the king who has everything decides he must have one of her creations, she tells him he must give away everything; then she will give him a quilt. In the process of shedding his many possessions, the king finds true happiness. No summary can do justice to the mesmerizing, fairy-tale quality of this beautiful tale. 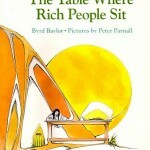 The Table Where Rich People Sit by Bryd Baylor ( Aladdin Picture Books). As her family attempts to calculate the value of the desert hills, the colors of blooming cactus, and the calls of eagles and great horned owls, a young girl discovers that her impoverished family is rich in things that matter in life, especially being outdoors and experiencing nature. Too Much Noise by Ann McGovern (Sandpiper Books). The Greedy Triangle by Marilyn Burns (Scholastic Bookshelf). Follow the greedy triangle to learn how wanting more and more and more can change your life in ways you might never expect. And reinforce those basic geometry skills along the way. The Money Tree by Sarah Stewart (Live Oak Media). Miss McGillicuddy's simple country routine continues through-out the year in spite of a very unusual tree growing in her yard. Why is it so easy to forget the many things we are grateful for when we discover something new that we desperately want? How can we remind ourselves to be satisfied with the good things already in our lives? What if we woke up tomorrow and only had the things we expressed gratitude for today? What is the difference between what you need and what you want? Is it wrong to want something more when you have so much? What would you do with a money tree if one appeared on your doorstep? If you have a little extra time, try one of our related activities. Consider creating a Gratitude Garland or take time to write thank yous to people who have inspired your gratitude. 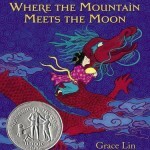 Independent readers, their parents, and even young ones willing to sit still for chapter books, will fall in love with Where the Mountain Meets the Moon by Grace Lin. Food Waste & Family Dinners: Share your Insights! Did your last family meal conclude with extras being scraped into the compost or garbage can? Mine did. Now I'm haunted by last week's Science Friday, "Waste Not: The Ugly Truth about Food Waste in America? It haunts me. They estimate half a hamburger wastes as much water as an hour long shower! With young kids in the house, waste is practically unavoidable. Learning to eat a well-balanced diet is a process - parents are told to try, try again when kids resist healthy foods. And my little ones are truly poor eaters in between growth spurts. When they're growing, give them (almost) anything and it disappears. Between times, even much-loved dishes sit barely touched at the end of the meal. I'm not a fan of waste, of course, so I save what I can for the next meal. Often, those saved bits get tossed. If this issues haunts you as well, check out Rethink Recycling and their article "How to Keep Food Waste out of the Garbage." Most helpful was their List of Companies that offer food recovery services in the metro area. Given the vast impact of institutional food waste, I'm choosing to worry less about the small scale waste of my own learning eaters. Instead, I'm going to check out the institutions around me. If I can help an organization or two redirect unserved portions to a local shelter, the impact on waste, and on the community will be significantly greater. And by talking about this issue with my children, perhaps they will be more aware about what they leave on their plate at the end of a meal. We've seen the horrible impact of bullying in the headlines. We all know how hurtful mean kids can be. Worse yet, we've all seen the capacity for mean-spirited play peek in our kids or ourselves from time to time. It's not pretty, and most of the time I'd like to blame it on a bad night's sleep, but it's there just the same. For a reminder on the many roles we all play in bullying, as the unhelpful bystanders, the victims, or the perpetrators, check out Dear Bully: 70 Authors Share Their Story by Jeannine Garsee. These popular young adult authors beautifully bring this issue to life. Many schools, nonprofits, and parent groups are working hard to teach kindness and the golden rule early, with the hope and expectation that this we can keep this problem from escalating. At Doing Good Together, we've shared many tips for teaching kindness in a way that empowers our children to be part of the solution. I'm eager to keep this discussion open in my own home. Because books are my preferred starting point for big conversations with my little ones, I've put together this list of our family favorites. Teach your kids how not to be a bystander with this story. One classroom has pledged to stand up for one another and to earnestly live by the golden rule. When the new kid starts to cause trouble, these classmates challenge one another to stay true to their pledge, ultimately teaching their new classmate what it means to be part of their community. I know this book pops up on every list. If you are wondering why, then perhaps you haven't read it in a while. The message in this book is so clear and so motivating, that even the youngest children will set at once to fill buckets. Perhaps even more remarkable, even the oldest readers find it inspiring too! Thinking of bullies as people with empty buckets is perhaps oversimplifying the issue, but it does help us all empathize with them. I'm a big fan of this book, because my instinct has always been to turn to humor in tight situations. It's fun, it rhyms, and best of all, this book gives you ample opportunity to discuss how bullying begins and how to shut it down. What's in a name, Shakespeare asked. For a child whose whole world is changing, the continuity of her own name may mean an awful lot. And friends who are willing to take the time to learn her name may mean even more. This is a great book about acceptance, friendship, and change. Teach your children (and remind yourself) to be true to their own idiosyncrasies, in spite of teasing. This book will have your whole family cheering one another on for much-loved quirks. And if you'd like to take your discussion even further, take a few minutes to do this simple Crumpled Paper activity. Even the youngest of children will respond to this powerful metaphor. Mean words last long after an apology, just as the creases in the paper remain visible after it is smoothed out.